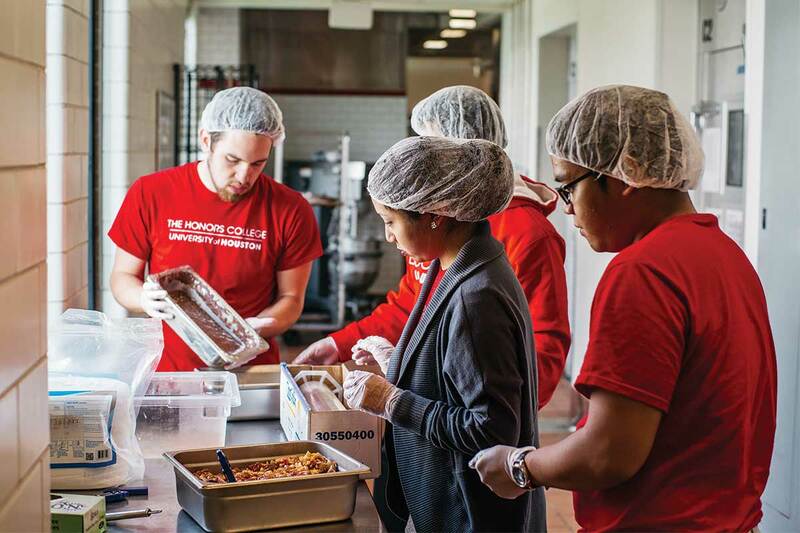 UH students serve the community with new campus kitchen. Members of the Bonner Leaders Program recover unused food from the Fresh Foods dining hall in Moody Towers to be served to residents at New Hope Housing in the Third Ward. In the fall of 2014, Professor Andrew Hamilton, the associate dean for Student Success in the Honors College and director of the Bonner Leaders Program, gave his Introduction to Civic Engagement class a simple assignment: Find a challenge within the community that you would like to address and write a proposal that would address that challenge. Brinda Penmetsa, finance major and member of the Bonner Leaders Program, greeted his challenge with an innovative approach by leading and organizing the first Campus Kitchen at a public university in Texas. Prior to arriving at UH last fall as a freshman, Penmetsa performed intense research to prepare for the civic engagement class, “I noticed we didn’t have any projects related to food, and I thought that was something Bonner could really focus and improve on.” The Campus Kitchen Project is a national organization that empowers student volunteers to meet hunger needs in the community. Five days a week, students from the Bonner Leaders Program partner with hospitality and facilities services provider Aramark to recover leftover unused food from the Moody Towers and Cougar Woods dining halls. In addition, students deliver the food three times a week to residents and serve once a week in the Third Ward at the Perry Street location of New Hope Housing, an organization that provides housing to residents with fixed or limited incomes. With few grocery stores and many fast food restaurants, residents in the University’s neighboring Third Ward community have limited access to fresh produce and minimal healthy dining options. For Penmetsa, service is necessary to revitalize the community. “It’s not just about how many pounds of food but it’s more of what relationship are we developing, and how are we building a Tier One culture of service?” She is not a stranger to leadership: She is a member of the Bonner Leaders Program, on the senate for the Student Government Association and one of the first Resolution Fellows to be selected from Texas at the Clinton Global Initiative University. Her team has secured more than $10,000 in grants, and the operation’s success has expanded from a team of five students to thirteen. Since Aramark has experienced an abundance of leftover food, two additional New Hope Housing locations have been added to receive provisions. The Campus Kitchen operation involves not only Bonner but the Hilton College of Hotel and Restaurant Management, the Center for Student Involvement, Aramark and the national Campus Kitchen Project. A grant expands opportunity for UH Project.